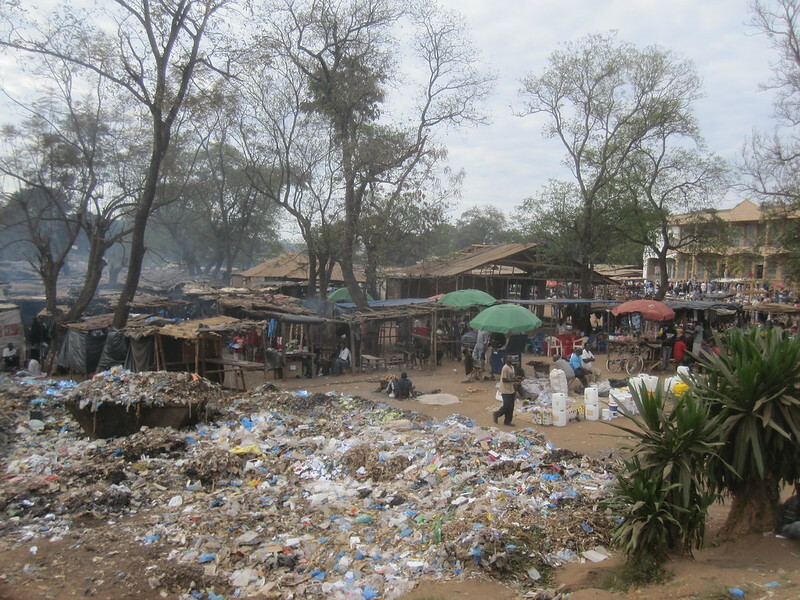 Here we see another African market in Livingstone, Zambia. There is a distinct contrast between the local flea market and the local supermarket. In small towns, the flea market is about all you will find. 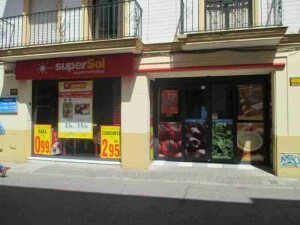 In the larger towns you’ll find at least one good supermarket with a bakery and refrigerated meat and frozen food. 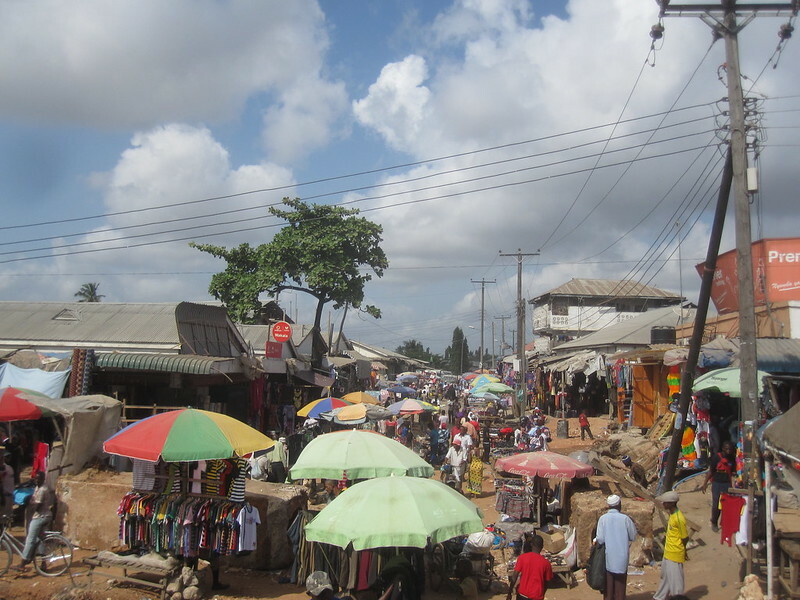 Life is quite different in the small towns of Africa than in the larger cities. In the rural areas, the lifestyle tends to be little more than subsistence living. There won’t be a lot of electricity, household furniture or even doors and windows. 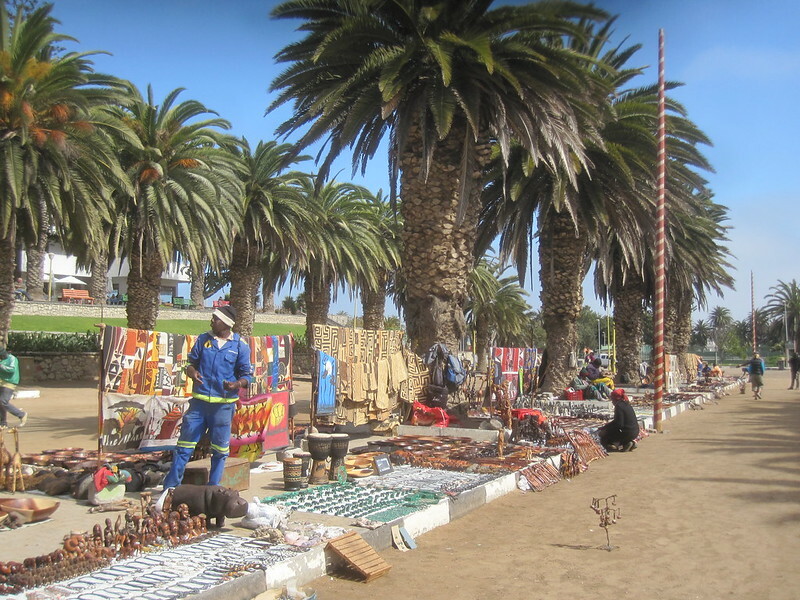 Africa tends to be a land of contrasts. This entry was posted in Travel and tagged Africa, Market, Overland Trip, Zambia on July 10, 2012 by Steve. 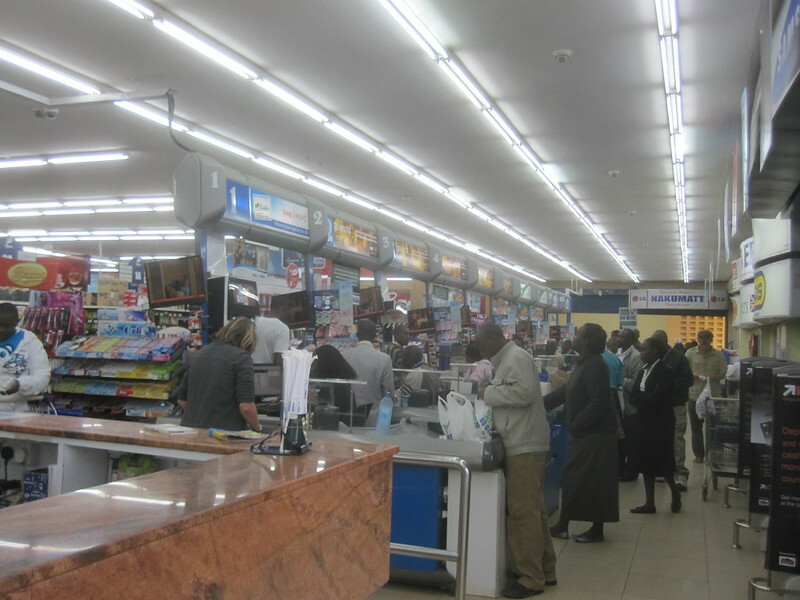 I took this picture of a supermarket in Livingstone. 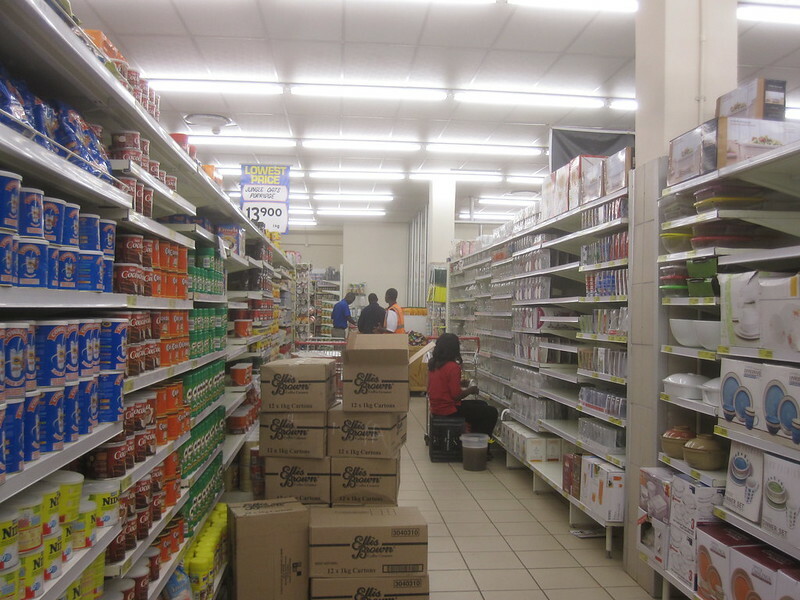 Gee, it looks like a supermarket like you might find anywhere else in the world. It was quite modern. They were busy stocking in the middle of the morning. It was on a Saturday. I would like to say that it wasn’t as large as a typical American supermarket, but it was similar in size to a locally-owned supermarket in a small town. Remember that Livingstone may be a reasonably good-sized city in Zambia, but it’s hardly has world-class status as a city. Lilongwe had a very nice shopping center. 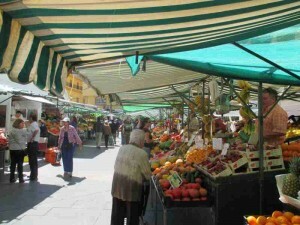 A few blocks away was one of the local markets. It was something of a dump. Literally. It was on a river and it appeared that there could have been a few homeless people living on the bank of the river. All that material in the foreground of the picture that looks like it might be trash is, well… trash. And the smell was overwhelming. I didn’t last long in this part of the Old Town. I thought it would be in my best interest to turn around and go back to the middle-class shopping center. So I did. 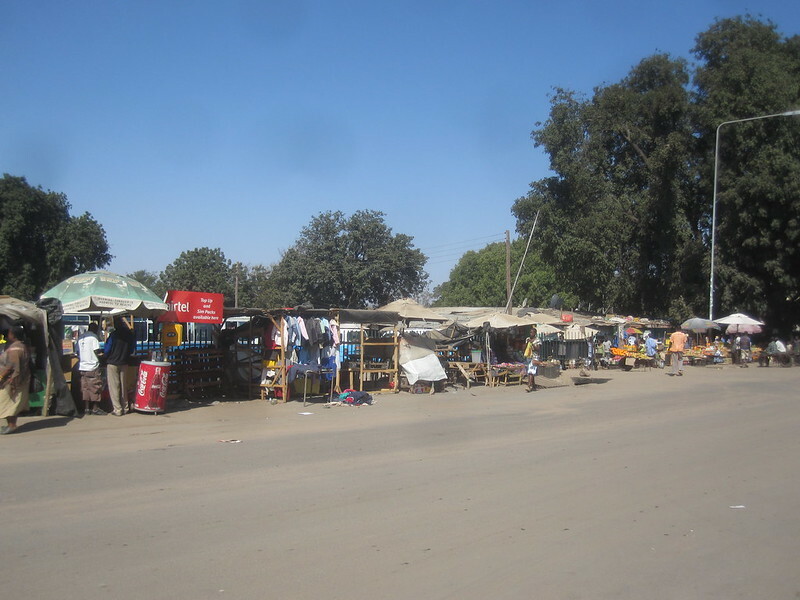 This entry was posted in Travel and tagged Africa, Lilongwe, Malawi, Market, Overland Trip on June 30, 2012 by Steve. It’s not really a good picture, but there is something of a problem taking really good pictures as we were traveling along the great Malawi motorway. The problem was that the good pictures could be gone in a moment of two. Yes, I could have been more prepared, but that would have required me to sit in readiness for the next great photo and I wasn’t willing to invest that kind of time into those few shots that were neat, but not earth-shaking. So, I tried to keep abreast of what was going on outside without letting it be all-consuming as far as my time was concerned. 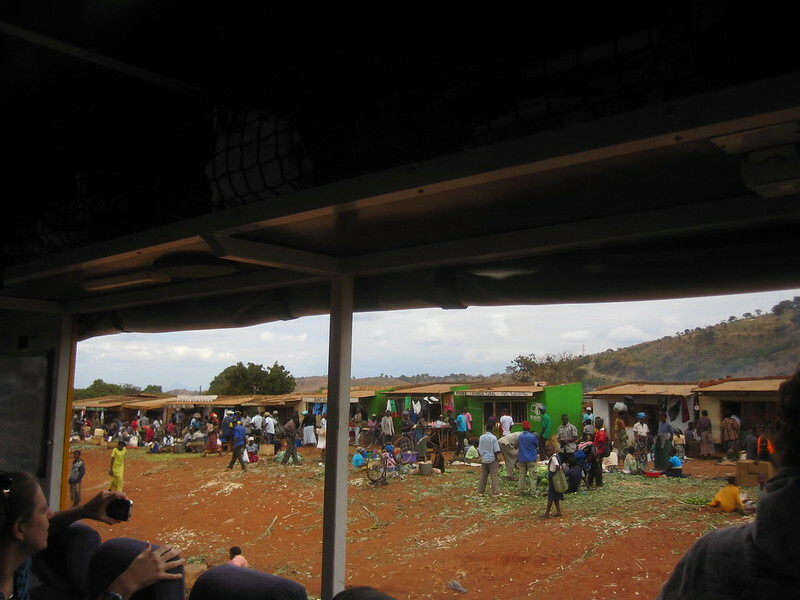 This shot was taken from inside the truck and, if you look at the largest size of the picture, you can get some detail as to what I would classify as a typical local market scene in a rural area. There were a lot of people, the environment was a needy candidate for adopt-a-street, and the market was full of things that could be bought for a very reasonable sum of money. This entry was posted in Travel and tagged Africa, Malawi, Market, Overland Trip on June 22, 2012 by Steve. This entry was posted in Travel and tagged Africa, Market, Overland Trip, Stonetown, Tanzania on June 21, 2012 by Steve. 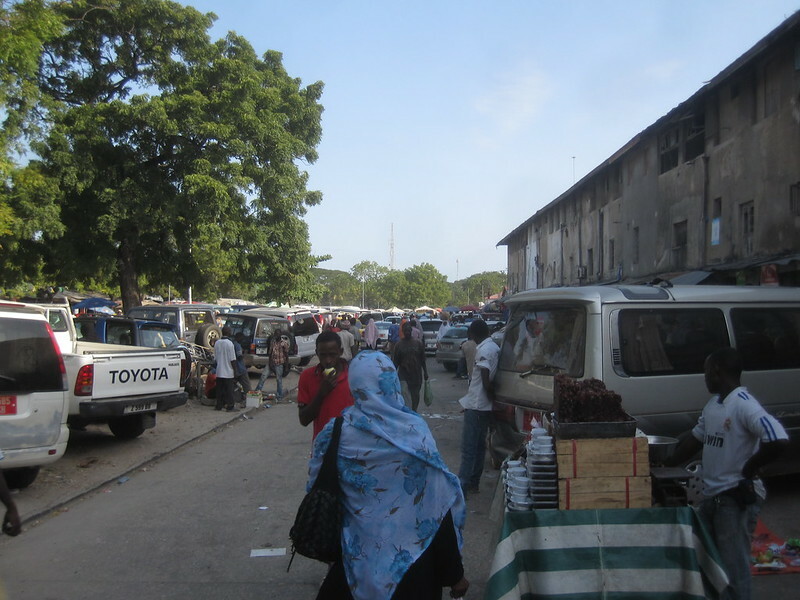 This is a picture of the market in Stonetown. 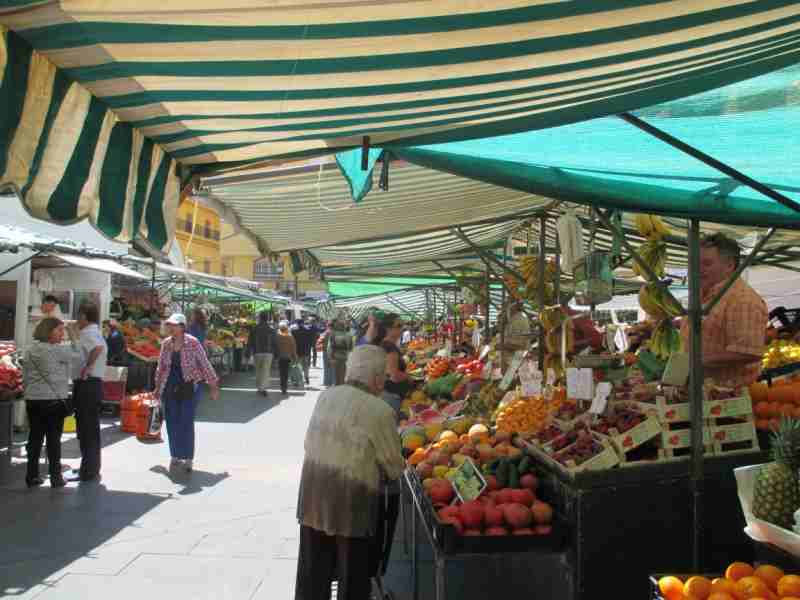 How I arrived at the market is an interesting story in itself. I was walking around looking for a bakery. I needed to find a couple of somosas. a local pastry that is quite tasty and costs 3 for $1. Needless to say, this budget traveler was eating them every time I spied what looked like a reasonably fresh one. As I was looking for a bakery one of the locals noticed me and attached himself to me. They do this in hopes they can wrangle a dollar or two out of a person. In the end, he not only took me to the bakery, he took me to the major market where this picture was taken as well as several other places. He turned out to be an excellent guide and I turned out to be a customer. This entry was posted in Travel and tagged Africa, Market, Overland Trip, Stonetown, Zanzibar on June 21, 2012 by Steve. This entry was posted in Travel and tagged Africa, Kenya, Market, Overland Trip on June 5, 2012 by Steve.